My mother-in-law makes the best sweet potato pie in the world, hands down! I always request it for Thanksgiving or any other family get together. She only uses a bare minimum of sugar and spices and that really allows the true flavor of the sweet potatoes to shine through. She also doesn’t use a recipe so I have never been able to duplicate her pie. It is really hard to measure “a dollop of this and a sprinkle of that”. As a result, I have been on the look out for a recipe that replicates the flavor of her pie. This recipe comes from one of my favorite dessert cookbooks, Southern Pies. It is about as close as I can get to my mother-in-law’s pie. Enjoy! Preheat oven to 375 degrees. Line a 9-inch pie plate with the crust, crimp the edges decoratively and then refrigerate while preparing the filling. Peel the sweet potatoes and cut into large chunks. Add the cut sweet potatoes to a large sauce pan and cover completely with water. Bring to a boil over high heat and then reduce the temperature to medium and cook until the chunks are very soft, about 25-30 minutes. Drain into a colander and lightly rinse the sweet potatoes with cold running water to cool them. Allow the sweet potatoes to drain well. Add the sweet potatoes to a large bowl and using beaters (or a stand mixer with the flat paddle attached) beat on medium speed until the potatoes are smooth with no lumps remaining. Add the sugar, cinnamon, nutmeg, vanilla and salt. Mix until evenly incorporated. Add the milk, eggs and butter. Mix until there is no remaining trace of the wet ingredients and the filling is thick and smooth. Pour the filling into the pie crust. Bake in the center of the oven until the edges puff up and the center is fairly firm, wiggling a only a little when the pan is gently nudged, about 50-55 minutes. Place the pie on a cooling rack and cool until room temperature. The center of the filling will continue to firm up after the pie is removed from the oven. Serve at room temperature or chill for several hours and serve cold. 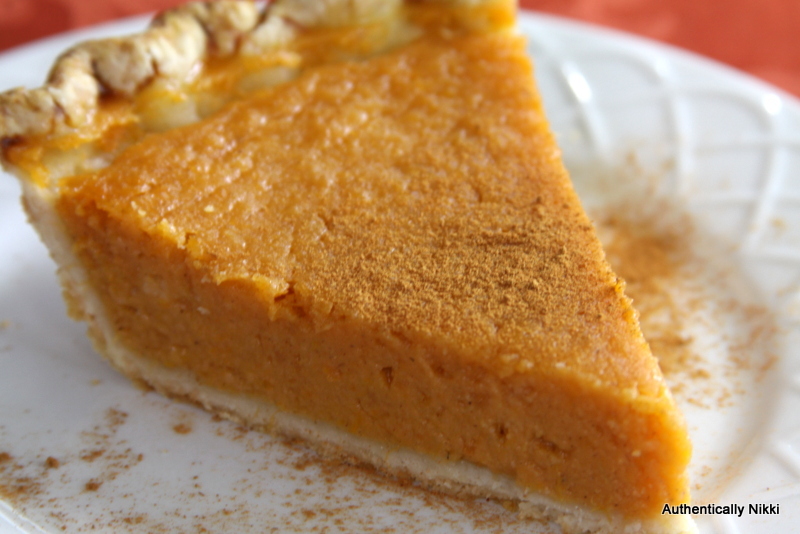 This entry was posted in Pies and tagged pie, sweet potato by authenticallynikki. Bookmark the permalink.